If you don’t have a clear marketing strategy or is planning to change your strategy, the list of strategic planning tools below will help you narrow in on the most important decisions in a coherent manner so that your resulting plan is high-impact, well defined and realistic. Defining your marketing strategy has multiple stages. We’ve grouped some of the most useful marketing strategy tools for each focus area for easy reference. The business model canvas is a one-page document that lets you work through the fundamentals of your business ideas in a single snapshot. Populating this upfront will outline all relevant aspects that one will need to consider when defining a marketing strategy. Click on the following template to edit it online. SWOT can help you analyze your business from a strategic perspective. It will help you identify how to capitalize on your opportunities using your strengths and how to avoid the threats and eliminate weaknesses. SWOT is an effective business planning tool used in businesses to form strategies. It helps analyze internal factors (Strengths & Weaknesses) that affect and external factors (Opportunities & Threats) that may have an effect on an organization. 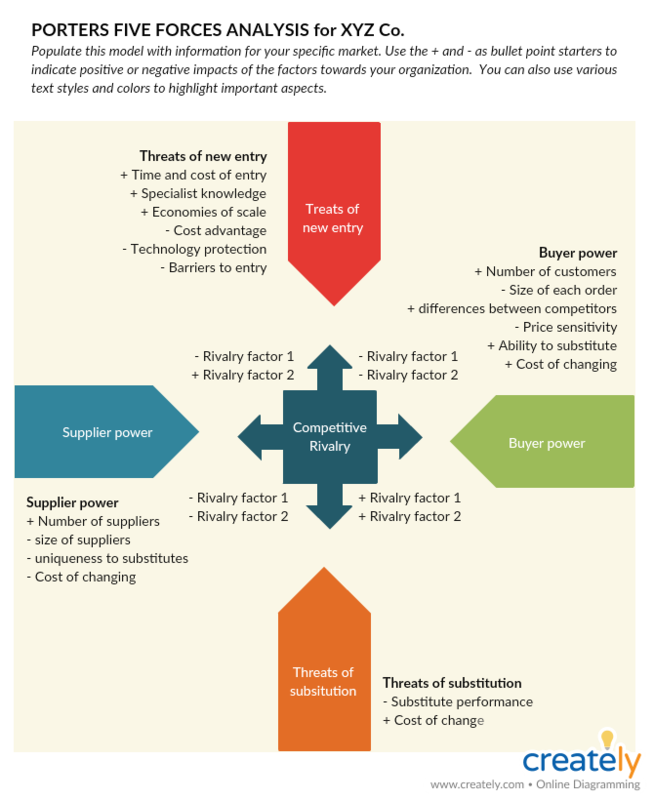 Porter’s five forces analysis has proven a useful strategic planning tool in both business and market-based planning, especially when it comes to understanding the level of competitive intensity within the industry. The Porter’s five forces analysis assesses levels of profitability, opportunity, and risk based on 5 key factors in an industry. This model helps identify the competitive forces that exist within an industry. In turn, these forces help determine the attractiveness and the profitability of the industry. This force looks at the power the supplier holds over businesses. What is the cost to you and them if you decide to switch suppliers? Are there a lot of suppliers who control the prices? This force looks at the power the buyer holds over your business. How many buyers do you have? How price-sensitive are your buyers? What information do you have on them? This force examines how easy or difficult it is for new competitors to enter the market. How easy is it to start a business in your market? What are the rules and regulations you need to follow? How much money would a new startup have to spend? Are there any barriers that would give you greater power? This force looks at how easy it is for a customer to switch from one business’s product to that of a competitor. How many substitutes to your product are out there? How easy it is for your buyer to switch to another product? Is there a cost to your buyer for switching? This force studies the intensity of the competition in the current marketplace. What is the competition level in market sector? Roughly how many competitors do you have? Customer journey mapping is a great way to visualize the user experience that helps when creating future marketing strategies. A customer journey map is basically a story of the customer experience. 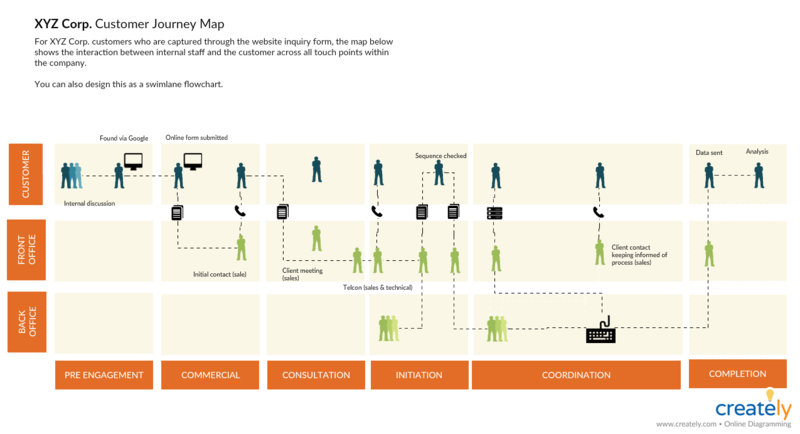 It maps the steps the customer takes when engaging with a company. The more touch points the interaction has the more complicated the map may become. If you already have created user personas, great! If you don’t, then get started! In order to map the journey of your user, you need to know who the person is first. Whether yours is a brick and mortar store or an online shop, there are ways to identify the touchpoints your customers would go through before buying your product or service. Using the correct tools, collect all the necessary data. There is no single right way to do a customer journey map. Your company can find something that works for you, even if it is a flowchart or a flow map like the one below. 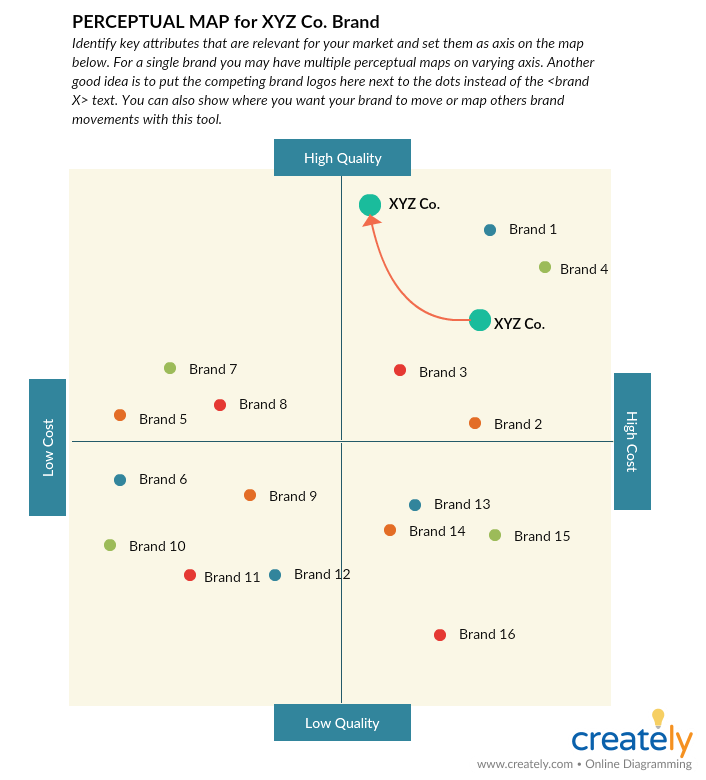 Marketers use perceptual maps to compare products and determine their positioning in the market based on how customers perceive them. During the product development process, a perceptual map can be used to identify new products. 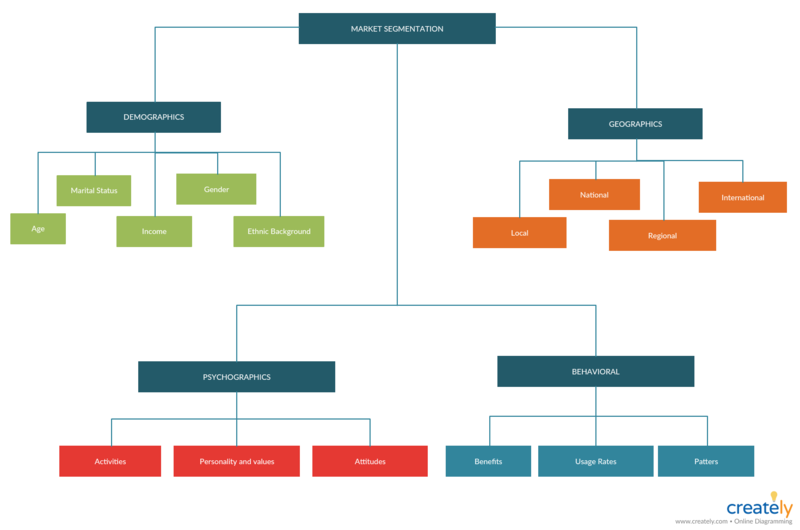 A perceptual map is a marketing planning tool that shows how the average target market consumer understands and perceives the positioning of competing products in a marketplace. Picking the right dimensions to measure positions in the market is important. It is recommended that you draw multiple positioning maps for the same market to understand it fully. Before you create a perceptual map, it helps to have decided what you want to learn from it eventually. Do you want to know where you stand against your competitors in the market? Or do you want to identify new opportunities for growth? To create a conceptual map you need data and data variables to display on the map. You can get this from a reliable source such as consumer reports, or from a research or survey that you’ve done yourself. Next is to display the data you’ve gathered on the map. There are multiple types of perceptual maps. You can edit the following perceptual map template online and enter your data by simply clicking on it. 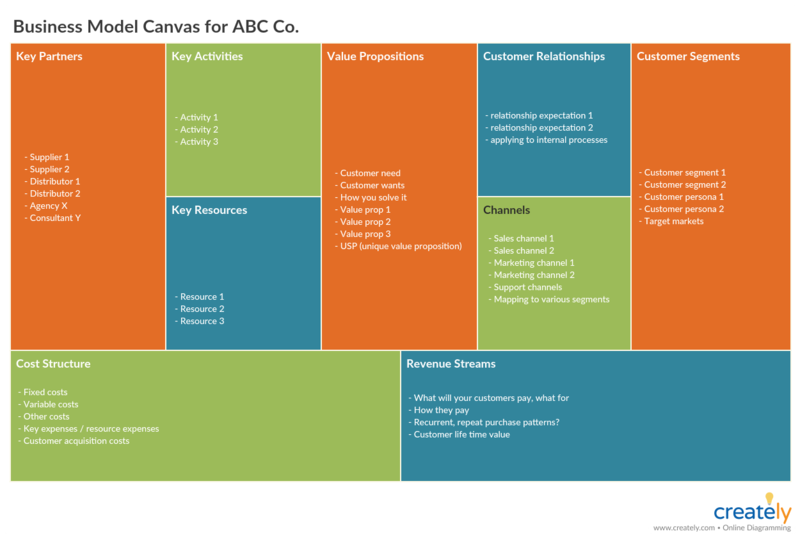 The Boston Consulting group’s product portfolio matrix is designed to help with long-term strategic planning. It is usually an essential section of a strategic plan or a marketing plan. 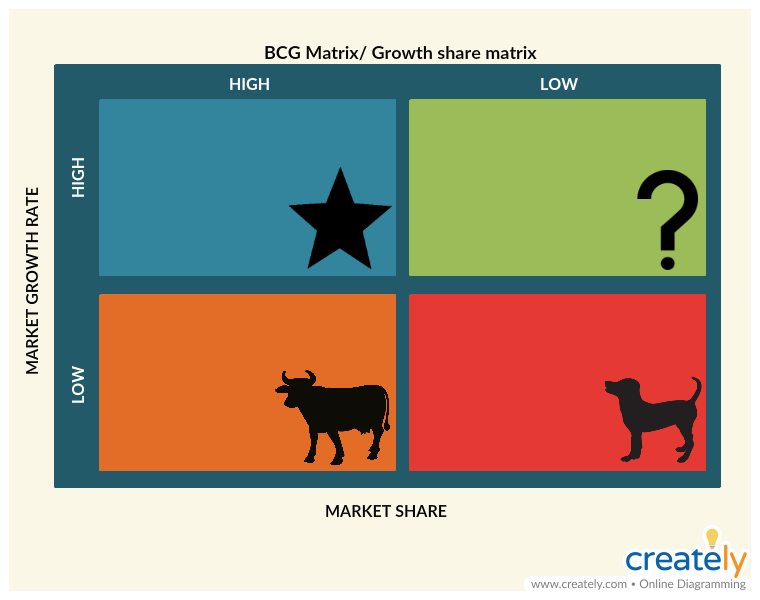 The BCG matrix is a framework for analyzing products according to growth and market share. It helps companies gain insight into what products they should capitalize on to grow their market-share opportunities. Collect data on your market share and the growth rate of your products. You need to compare yourself with your direct and largest competitor when examining the market growth. While the horizontal line shows the market share, the vertical line represents the growth rate. Place each of your products on the designated box based on where they rank in market share and growth. Marketing segmentation plays a major role in target marketing. Opposed to mass marketing, target marketing allows marketers to deliver personalized solutions to specific needs of customers. Marketing segmentation is the process of breaking down a wide market into smaller homogeneous groups of people based on similar characteristics, wants and needs. It’s important to clearly define the market of interest first. Identify the market’s geographic boundaries as well. This is where you identify the different types of consumers that are in this market. You can separate them based on their purchasing behavior, age group etc. This framework is designed to assess the attractiveness of a market segment before deciding which market to target. Keller’s brand equity model helps marketers build a brand and manage a brand that customers will strongly feel about and support. The brand equity model is also known as the CBBE (Customer-Based Brand Equity) model. It shows how to understand the customer and how to build strategies accordingly. According to it, in order to build a solid brand, you must first shape how your customer feels about your product. The first step is to get your target market to notice your brand – really become aware of it. While you need to stand out from your competitors, you need to know who your customer is in order to really get their attention. Here ‘performance’ means how well your product meets the needs of your customers, while ‘imagery’ means how well your brand meets the needs of your customers on a social and psychological level. Determining these will help you create your brand personality. Your customers may judge your brand according to its quality, credibility, consideration and superiority. And they may respond to it based on 6 positive brand feelings (warmth, fun, excitement, security, social approval, and self-respect). 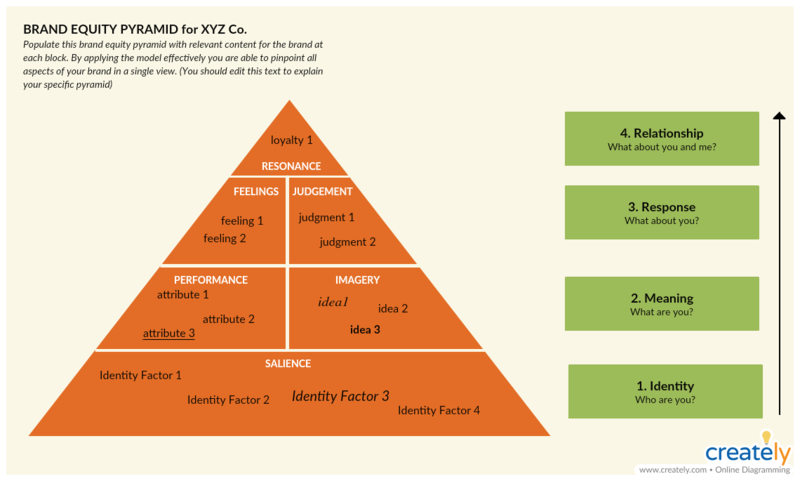 Identify how you can improve your brand based on the 4 categories of judgments and come up with strategies to enhance the 6 brand feelings of your customers. In order to increase the bond your customer has with your brand, you can run loyalty programs, promotions, give away gifts etc. The goal is to get your customers to be involved with your product even when they are not purchasing it or actively consuming it. 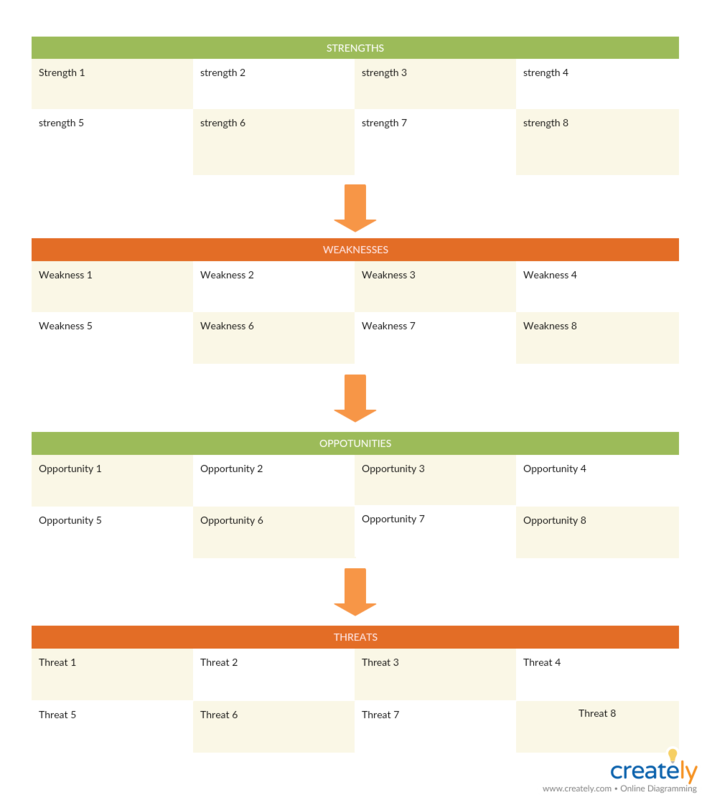 The Ansoff matrix is an essential strategic marketing planning tool. It can be applied to identify possible growth strategies for your company. Ansoff matrix is a marketing planning tool that helps businesses when developing their product and market growth strategy. 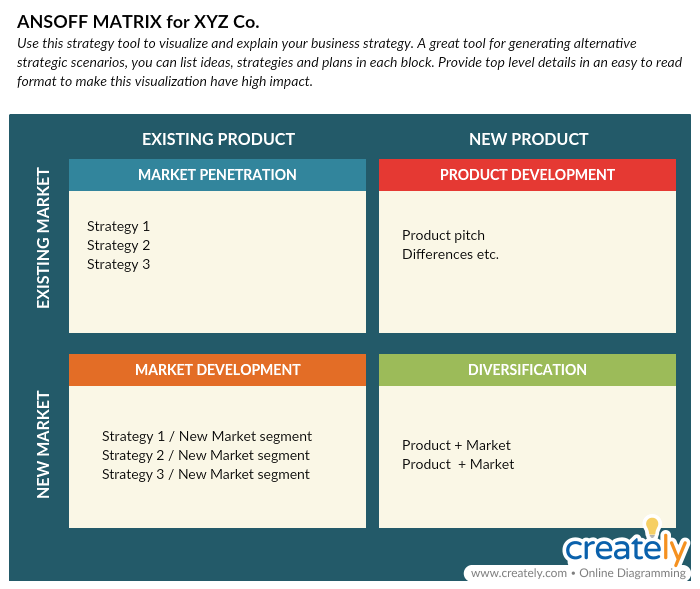 The Matrix has 4 different growth strategies; Market Penetration, Market Development, Product Development, Diversification. As the diagram shows the matrix gives marketers four possible scenarios/ strategies for marketing efforts and future products. Depending on the stage of your business, you may be executing one or more of these four strategies. How to sell more of your existing products to your current customers? How can you defend your market share? How can you grow your market? Here the firm aims to grow by selling its existing products to new markets. How can you expand into new markets? Is it through new market sectors? Is it through new geographical areas? The firm develops new products targeted to its existing market. How can you grow your product portfolio? What new products can we build? Can we modify our existing products? Here the firm aims to transform itself into a new business by developing new products for new markets. 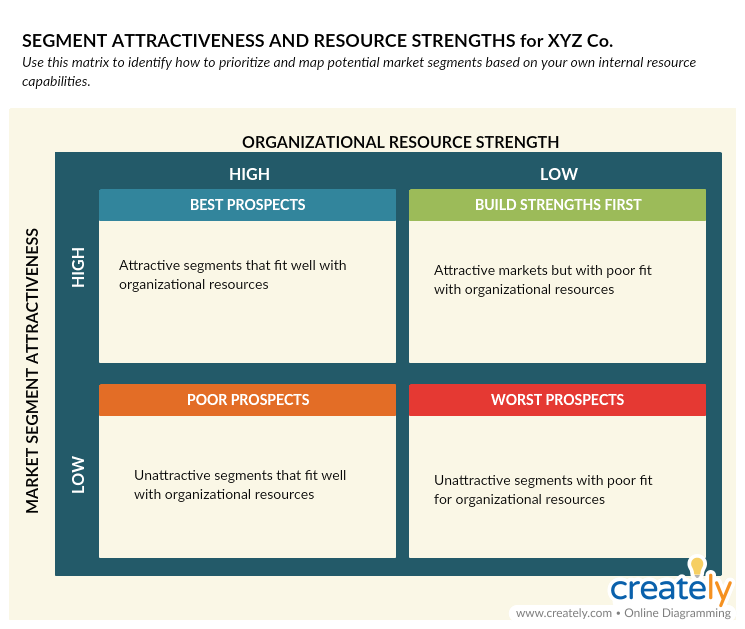 Do you have enough resources to target a new market? What sort of market would you target? Is it something you are familiar with or completely new to you? Kapferer brand identity prism shows how to build a strong brand story and give the brand a recognizable identity based on six important facets of brand identity. 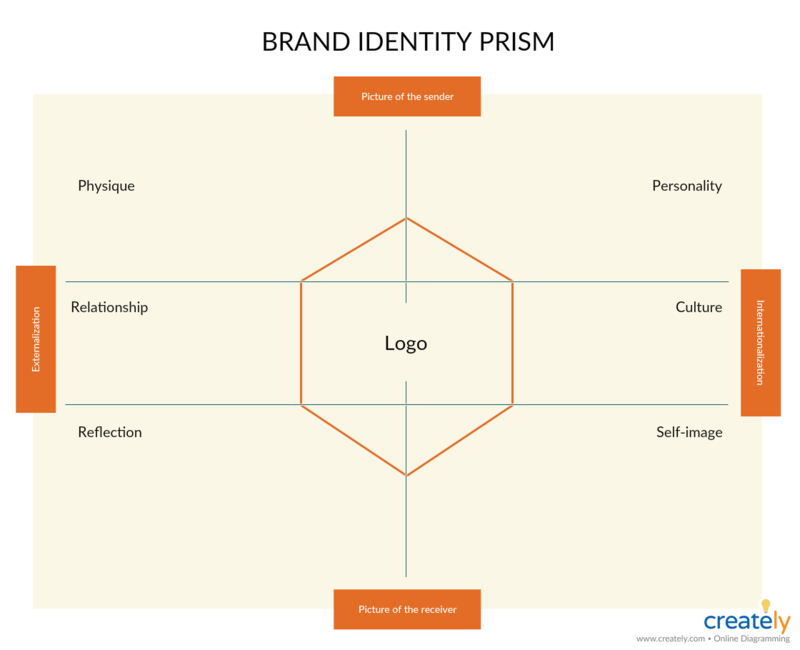 According to Jean-Noel Kapferer’s Brand Identity Prism, a brand’s success is driven by a company-wide utilization of the following elements; physique, personality, culture, relationship, self-image, and reflection. A company that can maintain a combination of all the six traits will be able to build a stronger brand personality. Using the template below, you can see how your brand meets each of these traits. 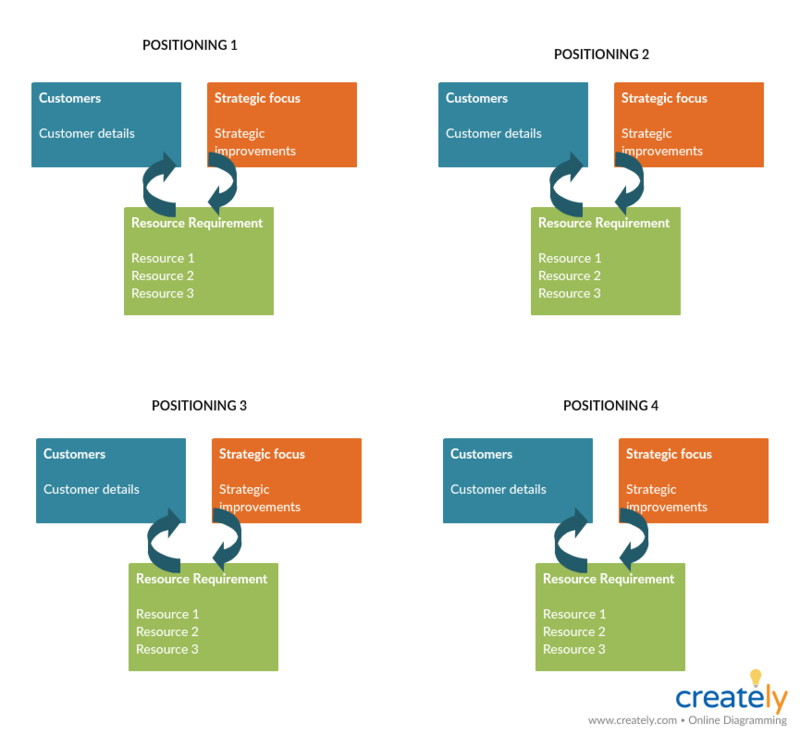 You may have different strategic positioning options, and this simple structure helps you visualize multiple options from the perspective of how you target customer segments, needs and wants with various strategies underpinned by the relevant resources. Mapping multiple strategic options will help you compare and contrast strategic choices so you can drive towards the most viable option. Marketing data dashboards are handy reporting tools when it comes to discussing and analyzing progress you’ve made over time in your marketing campaigns. 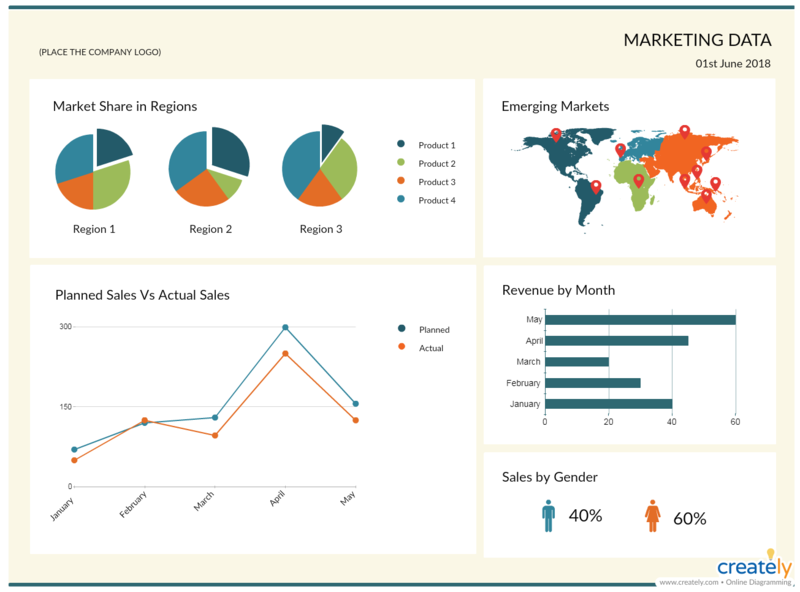 A marketing data dashboard is a visual summary of marketing KPIs (key performance indicators) and metrics. It displays analytical data in a simplified version that is easy to read and understand. Not all the data from all the campaigns can be added to one dashboard. You may maintain separate dashboards for different campaigns, and as such select the different types of metrics or KPIs you want to highlight to your stakeholders or team. Whether it is the number of visitors to your site or the rate of conversion, you need to select the correct visual tool to represent the data. The balanced scorecard is a handy tool strategic marketing managers can use to control and monitor key performance indicators. A balanced scorecard is a business framework or a management system that is used to track and manage a company’s strategy. BCs are widely used in businesses, governemnets and nonprofits. 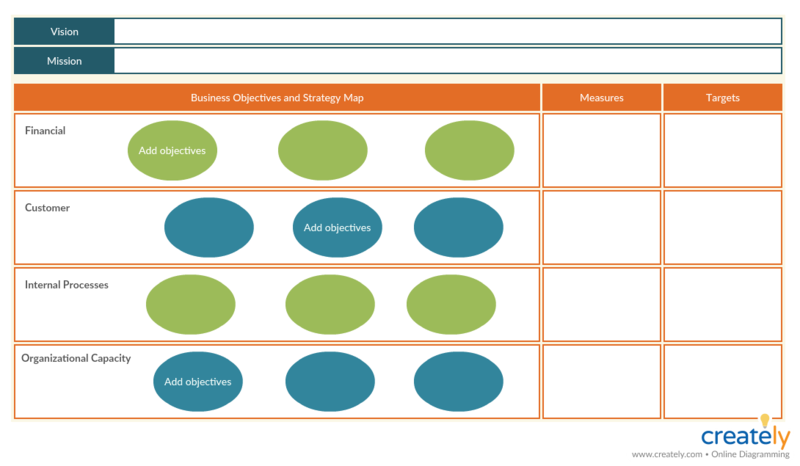 The scorecard starts with the center where the vision of the company is elaborated. A balanced scorecard contains 4 perspectives (Financial Perspective, Learning and Growth Perspective, Business Process Perspective and Customer Perspective) and they are placed in a ring around the center. Under each perspective write down the relevant objectives, measures, targets, and initiatives. Show that each perspective is interconnected and plays a vital role in a company’s vision by linking them with arrows. Want to expand our list of marketing strategy tools? Feel free to mention those tools that you usually use (and we haven’t already covered here) in the comment section below. Struggling with your marketing plan? We’ve got you covered. Our comprehensive guide to creating a marketing plan touches on various useful tools that you can use to accelerate your marketing planning efforts.